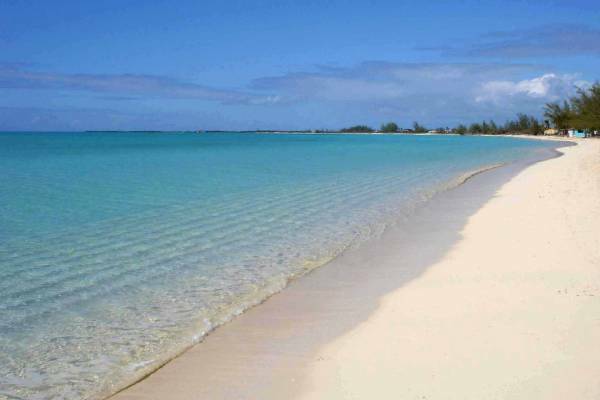 As summer comes to an end, The Bahamas continues to experience solid growth across tourism sectors. Airlines, hotels and tour operators are consistently contributing to the national momentum through many exciting travel deals, expansion of nonstop flights and development of unique on-island experiences. Beginning on Saturday, 12th October 2018, Bahamasair will offer a nonstop service from Miami, FL (MIA) to San Salvador, Bahamas (ZSA). The Saturday-only service will operate on a Boeing 737 aircraft, which can accommodate 120 travellers per flight. Delta Air Lines will add a second daily nonstop flight to Nassau, Bahamas (NAS) from New York's John F. Kennedy International Airport (JFK). The expanded Nassau service will begin on 1st October 2018, and is currently available for booking. Silver Airways are having an end of summer sale – For a limited time, the airline is offering travellers some great low prices on routes both within Florida and to The Bahamas. Fares to the islands start at $84 one way. The Islands Of The Bahamas have a place in the sun for everyone. Each island has its own personality and attractions for a variety of vacation styles with some of the world's best scuba diving, fishing, sailing, boating, as well as, shopping and dining. The destination offers an easily accessible tropical getaway and provides convenience for travellers with preclearance through U.S. customs and immigration, and the Bahamian dollar is on par with the U.S. dollar. Do everything or do nothing, just remember It's Better in The Bahamas. Did you know, The Bahamas is comprised of 700 islands and over 2,000 rocks and cays, sprinkled over 100,000 square miles of ocean. The archipelago is an ecological oasis, boasting the clearest water on the planet. Each island takes natural beauty to another level and has a personality of its own, both rich in culture and history. There is a multitude of beaches, some busier than other, Old Bight Beach, pictured above, is one of the more secluded, a perfect getaway spot for a quiet walk, beach picnic, shelling, or sunbathing. 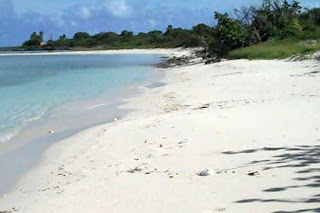 Or how about a walk along the beach pictured above, it is called Big Bay Beach and is perhaps everyone's idea of beach paradise, plus you'll have an interesting walk to get there from the roadway. 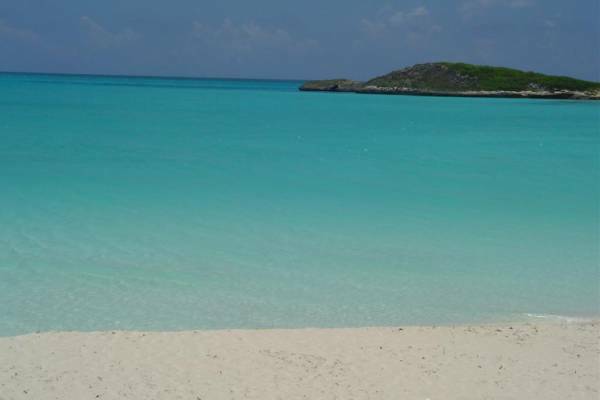 Another ideal location to escape from the world for a while is Tropic of Cancer Beach, also known as Pelican Beach, shown below, which is a graceful crescent of white-powder sand bordering the translucent blue-green water along the coast of Little Exuma. 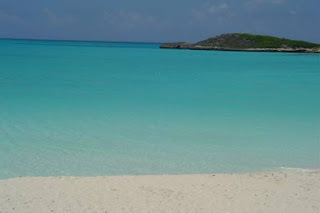 The longest beach on the island, it is also the prettiest in the Exuma chain and you will probably have it all to yourself - but shsss, let's keep it just between us, so it stays a secret! The Bahamas are so much more than just home to some of the best beaches on the planet, the islands have a rich tapestry of culture, music, food and entertainment, that will entice and delight you. Some of the top nightspots include Bahama Mama's popular with both locals and visitors and open until the early morning! La Patio is an outside bar & lounge located at Blue Caviar, Lyford Cay and is certainly a fun experience. Oh and for the best Goombay Smash in the islands, then you'd better head on over to Miss Emily's! Shopping is another attraction in the Bahamas, loads of local craft items make the perfect gift to take home for friends and loved ones. Also, you might not know that back in 1992 the Government of the Commonwealth of The Bahamas abolished all import duties on perfumes, fragrances, crystal, leather goods, jewellery, fine linens, tablecloths, watches, clocks, photographic equipment, china, binoculars, and telescopes. Savings on these items are significantly below US prices, which means they are massively cheaper compared to UK prices. Duty-free shops are marked with the DFS logo, so you'll be bound to pick up a bargain or two. So many wonderful places to dine in the islands, that you'll be spoilt for choice, something for every pocket and every taste bud too. Bahamian cuisine is often spicy and uniquely flavoured which deserves to be sampled as often as possible. Oh and don't get us started on the cakes and desserts, we're so crazy about bennys! Whatever you go on holiday for, you'll find it in The Bahamas, but perhaps the greatest sight you'll see is the smiles on the faces of the Bahamian people.